Arya Vaidya Sala started conducting annual Ayurvedic seminars in connection with the Founder’s Day Celebrations in 1964 and All India Essay Competition in 1965. The proceedings of seminars and prize winning essays were published regularly. They covered a wide range of topics and have become a veritable source of information for students and researchers in the field of ayurveda. The topic for essay competition for 2003 was endometriosis. The essay adjudged best is published now. Endometriosis is termed as the disease of theories. It is because the exact knowledge regarding the etiology of this disease is still uncertain; in addition lot of theories partially explaining the occurrence of this disease exist. It is a gynecological problem occurring in some females during the fertility period. It is characterized by the formation of emdometirum like cells on the ectopic parts of the body other than in the uterus, like ovaries, parts of viscera, appendix, or even remote places like lungs and brain. As per the influence of the female hormonal stimulation, it acts as bleeding spots, just like the endometrium and manifest a variety of symptoms, and is a real agony for the patient. In addition, it is one of the main causes of infertility. In the present time a comprehensive approach to this disease is very essential due to the increasing percentage of incidence day by day. This essay, ranked first in the competition, deals with all the aspects of endometriosis in a scientific way. How that this will be useful for students and scholars alike. Women are the original source of progeny. So the ailments, suffered by women definitely make an impact on the progeny also. 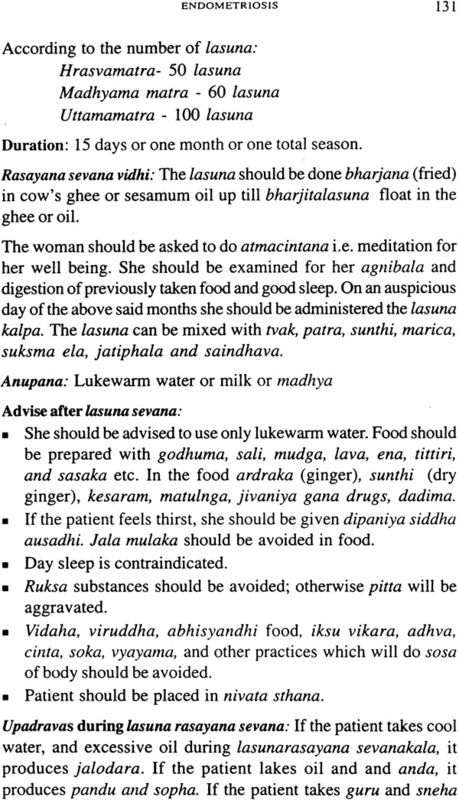 In Astanga Ayurveda we won’t get a special branch dealing with the diseases of women, rather it is included in kaumarabhritya itself. 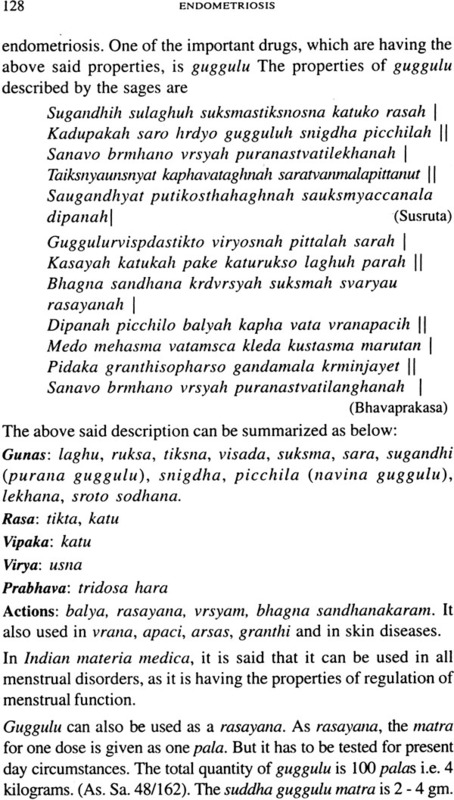 Cakrapani commenting on the verses of Carakasamhita says that the subject concerned with bharana of kumara comes under kaumarabhritya. The subject concerned with the achievement of conception, its maintenance and delivery, then its protection, support and nourishment come under the purview of kaumarabhrtya. 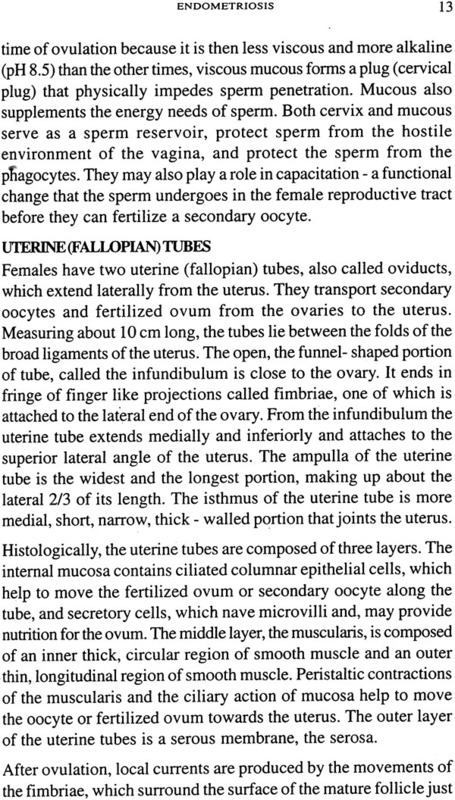 To know the physiopathologies of the achievement of conception, the knowledge of anatomy and physiology of the female reproductive system, descend of embryo as well as the abnormalities of artava and yonivyapat is essential, because in the presence of menstrual or other gynaecological disorders women may not conceive. 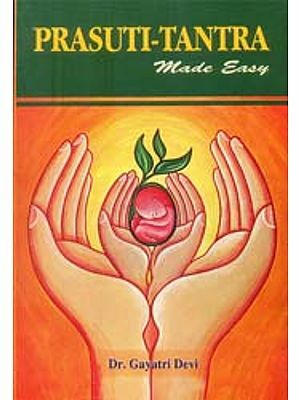 Trisutras are the basic concepts of ayurveda to study and understand the diseases. These trisutras are hetu, linga, and ausadha. 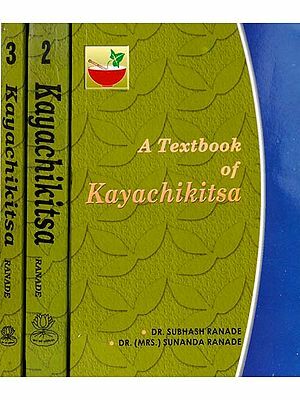 To understand any substance (padartha), the three essential factors that have to be gone through are astitvam, abhidheyatvam and jneyatvam. When there is a new thing, which has to be understood the order of these three factors will be in order of astitvam, jneyatvam and abhidheyatvam. 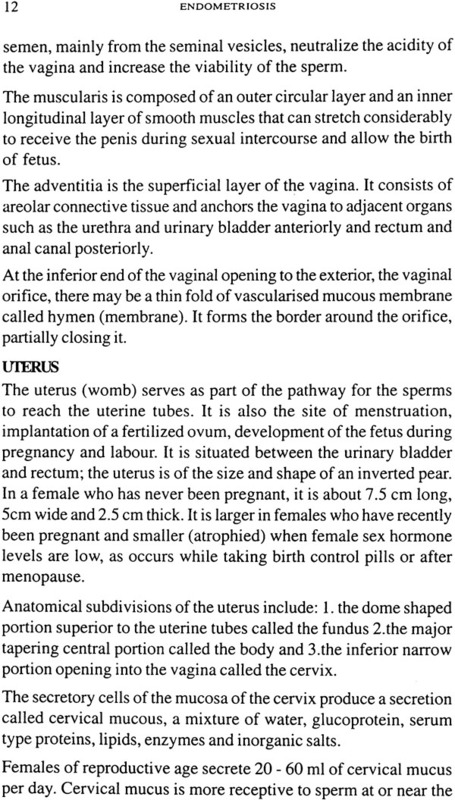 Here also the subject endometriosis as it is mentioned in modern science is not known to ayurveda. Ayurveda is having its own principles of dealing with the diseases. The approach of ayurveda is having its own principles of dealing with the diseases. The approach of ayurveda is different from that of modern science in classifying and studying the diseases. Ayurveda is having its own theories of atma, manas, karma siddhanta, indriyas and their arthas, tridosas, saptadhatus, malas, srotas, nidana pancake, treatment modalities of samsodhana and samsamana etc. By the above-mentioned principles of ayurveda, it is possible to understand and evaluate each and every problem of human beings. Because Bhagavan Atreya in Carakasamhita says. Nahisarva vikaranam namatosti dhrvasthitih !! Sa eva kupito dosah samutthana visesatah ! Sthanantara gatascaiva janayatyamayan bahun !! Samutthana visesamsca buddhva karma samacaret !! If a physician is not able to name a particular disease, he should not feel shameful on that account, because it is not always possible to name all types of diseases in a definite term. When aggravated, one and the same dosa may cause manifold diseases depending up on the various etiological factors and the sites of manifestations. 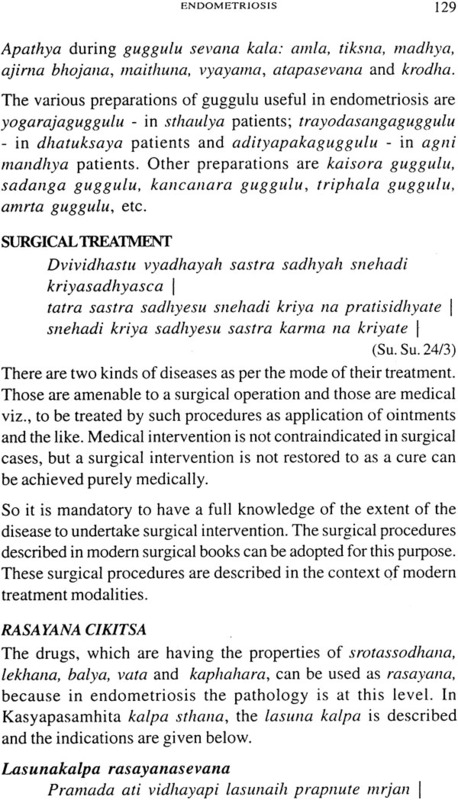 So a physician should try to comprehend the nature of the disease (dosa), the site of its manifestation, the etiological factors and only then initiate the treatment. A full knowledge of the therapeutic properties of these three aspects and the due regards given to scriptural instructions, would never fail his attempt to cure the disease. To understand endometriosis from the Ayurvedic point of view, the same principles are followed. As endometriosis is the disease described by modern medicine, it is essential to study this disease from that angle. Then it should be analyzed according to nidana pancake theory of ayurveda based on the concepts of dosa. Dusya, srotas, sthana, samprapti and its management. 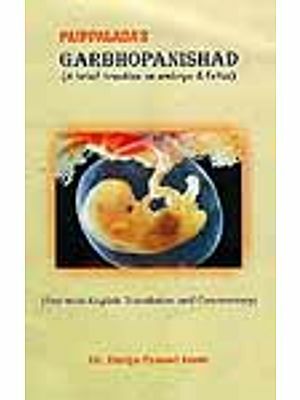 Anatomical and physiological concepts of the female reproductive system of modern medicine as well as ayurveda are dealt first. The complete available description on etiopathology and symptomatology is collected from modern medicine. 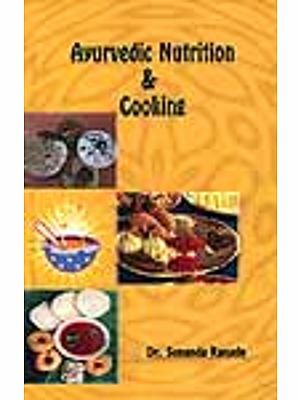 The collected descriptions on etiopathology and symptomatology are studied critically in Ayurvedic concepts of dosa, dusya, srotas, samprapti etc. Equivalent correlation of endometriosis with gynaecological disorders of ayurveda is made. The treatment is discussed, based on the samprapti anughatakas and the possible equivalent diseases of yonivyapat with endometriosis, in detail. Endometriosis is a gynecological problem occurring in some females during the fertility period. It is characterized by the formation of emdometrium like cells on the ectopic parts of the body other than in the uterus, like ovaries, parts of viscera, appendix, or even remote places like lungs and brain. As per the influence of the female hormonal stimulation, it acts as bleeding spots, just like the endometrium and manifest a variety of symptoms, and is a real agony for the patient.